Watching the marriage of Kate and William today, I was thrilled to see one of the world’s last Lancasters fly in formation over London. For most of the Canadians in the crowds around Buckingham Palace or watching on tv, the significance of this flight might not have been apparent. In the very early morning of April 29, 1945, exactly 66 years before, two Lancasters lifted off from their base in England to fly in bad weather to occupied Holland. They were on a mission of mercy. Both planes were loaded with sacks of flour, egg powder, powdered milk and tins of dark chocolate intended for the people of Western Holland who had suffered through a long Nazi occupation as well as a terribly harsh winter. Tens of thousands had died of starvation during the winter and spring and others were subsisting on whatever food they could scavenge, sometimes only sugar beets and tulip bulbs. The first Lancaster to reach the shoreline was “Bad Penny”, flown by 21-year-old Captain Robert F. Upcott of Windsor, Ontario. As in the old expression, “… like a bad penny, it keeps coming back”, Upcott and his crew (comprised of four other Canadians and two Brits) returned safely from their flight over enemy territory after “bombing” a targeted field with their load of food. Their successful test run served to launch the Allies’ “Operation Manna;” over 11,000 tons of food was dropped in 10 days during the mission – another signal to Nazi Germany that it was losing the war. Chuck Rees, graphic designer for Walkerville Publishing, created this composite photo of the Bad Penny crew. 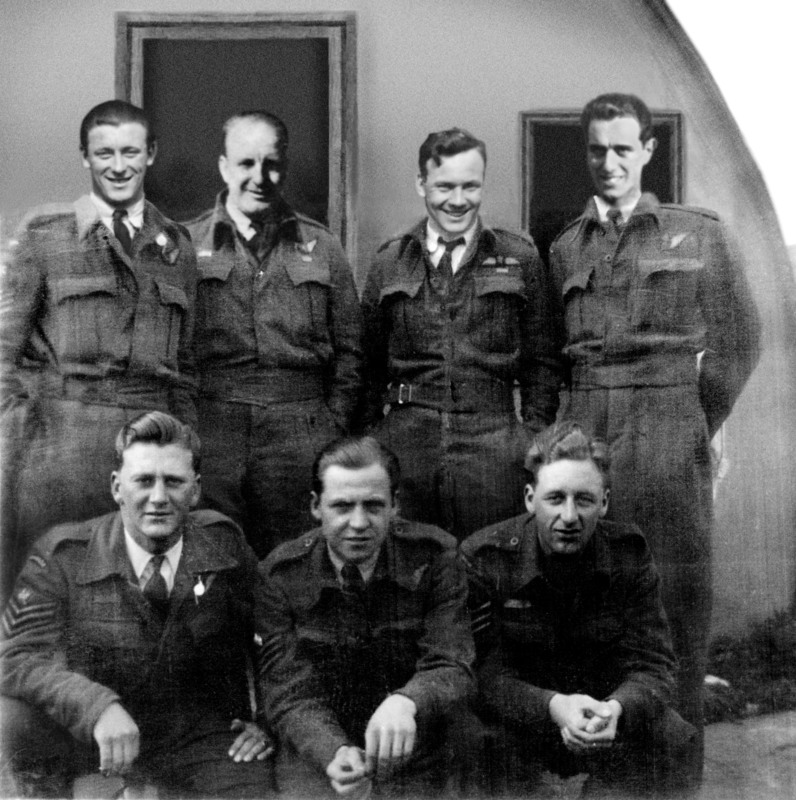 Pilot Bob Upcott stands second from right and Wireless Operator stands far left. Stan Jones, Wireless Operator on Bad Penny, recalled that Pilot Bob was exceedingly calm under fire and to steady his nerves, always chewed gum during their missions. He was very quick witted and on their test flight to Holland to drop food bundles, not only did Bob have to fly at certain times with German guns trained on them, he had to fly through heavy clouds over England. At one point, an American Flying Fortress appeared on the starboard wing on a collision course. Fortunately, Bob dove and the U.S. plane pulled up, missing a collision by inches! After the war, Bob Upcott returned to Windsor, where he worked for the City of Windsor. He died August 27, 2001 at the age of 78. 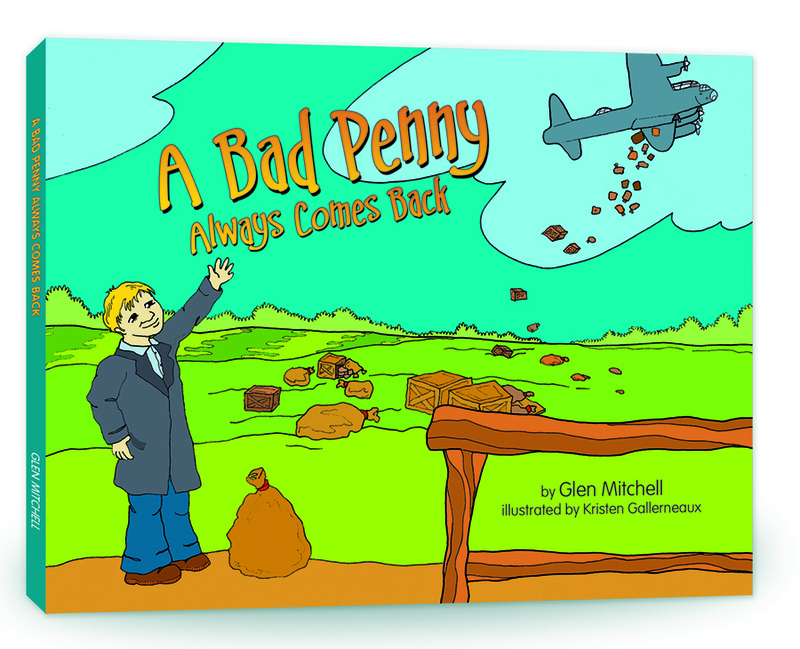 A few years later, Glen Mitchell published the children’s book, “A Bad Penny Always Comes Back”, to keep the story of Pilot Bob Upcott and his Lancaster alive. His book and accompanying puzzle are available at Juniper Books in Windsor, in the gift shop at Windsor Airport, or online through the book’s website. Each purchase helps volunteers of the Canadian Historical Aircraft Association restore Windsor’s Lancaster, which has been moved to Windsor Airport. Last year, to mark the 65th anniversary of Bad Penny’s historic flight, I thought it would be exciting to use Skype to connect Windsor children with children in the Netherlands who look after a monument built to commemorate Operation Manna. Here is a video made by the Amsterdam based book p.r. firm Uphill Battle of celebrations at the Dutch school and the Skype call between some of their students and students at Central Public School in Windsor. Here’s Walkerville Publishing’s video of how the Skype call looked from our side of the Atlantic. You can continue reading about the flight of Bad Penny at NowPublic.com and more about how Bad Penny is remembered in The Netherlands here. Rosalie turns 17. 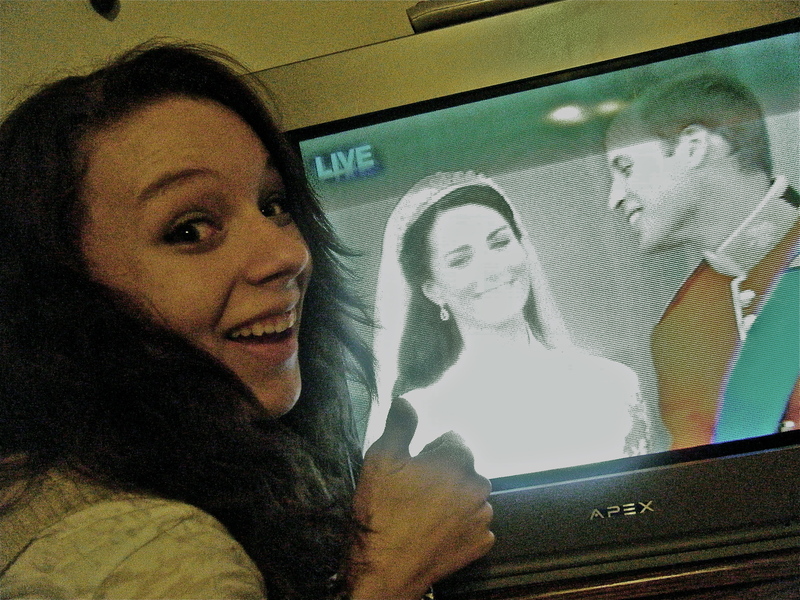 Kate and Will get married. 66th anniversary of Operation Manna. So much to celebrate! And last but not least, it was my daughter’s 17th birthday today. This entry was posted in People, Windsor Now, Windsor Then and tagged A Bad Penny Always Comes Back, Allies, Bad Penny, Bob Upcott, book, Buckingham Palace, Duke and Duchess of Cambridge, flight, food drop, Glen Mitchell, Holland, Hunger Winter, Kate, Lancaster, marriage, mercy, mission, Nazi, Operation Manna, Pilot Bob, Queen Elizabeth, RCAF, romance, royal, Skype, Stan Jones, The Netherlands, Uphill Battle, wedding, William, Windsor, WWII. Bookmark the permalink.